Link to the full story here. 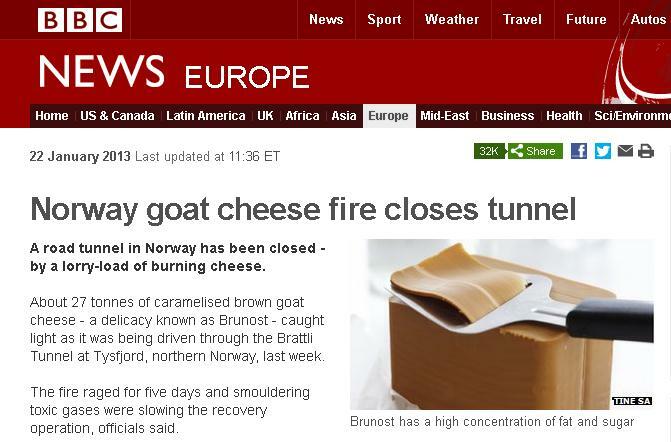 Okay, you’re laughing at the idea of seeing the spectacle of a massive road-closing Brunost goat cheese fire. It’s okay, I laughed too. But when I was done laughing, I bowed my head and observed a moment of silence for the loss of the baby cheeses. I am a great respecter and lover of cheese, and this is a sad loss for the world. So much delicious cheese, gone forever. I never knew ye.